When he returned to New York City from Paris in 1949, Witten pursued yet another art besides painting: gilding and carving picture frames. Good fortune had led him to meet Bob Kulicke on the ocean-liner between France and the United States. Leaning on the rail and looking out at the rolling seas, the two men discussed picture-frame making. The conversation piqued Witten’s interest, and he worked for Kulicke for a short while, and then moved on to Bernie Walsh’s shop in lower Manhattan. During the 1950s, Witten became a skilled gilder (using the water-gilding method) and wood carver and this trade continued to be a mainstay of his income well into his seventies. Water Gilding is an ancient art. It was lavishly employed in Egypt, Greece and Rome and during the Renaissance. It has been practiced continuously in Asia. Gilding involves the use of gold that is pounded into paper-thin leaves. The gold is cut (the pinky fingernail suffices) and laid on a surface prepared with smoothed layers of gesso (plaster) and clay. The top clay layer is burnished to a shine before receiving the gold leaf. When the gold leaf is laid upon this polished yet also slightly porous surface, the two substances – gold and clay – stick to each other without the use of glues but rather through molecular adhesion.The gold is then either left matte or burnished to a lustrous shine with an agate stone. Witten mastered the art of gilding in Manhattan and later went into business for himself in the Bennington, Vermont/Saratoga, New York area. 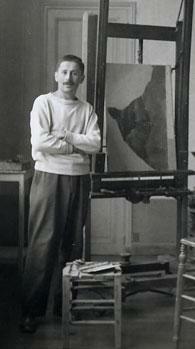 He also researched Italian and Spanish carving styles on furniture and frames he encountered in museums. Witten did careful drawings of these carvings and then recreated them back at his carving bench. In Arlington, Vermont, Miles Lumber worked closely with Witten to meet his specifications for moulding designs into which traditional patterns could be carved. They supplied him with the mostly basswood stock that he used for his carved frames. Witten’s frames were sought after throughout the Northeast and also shipped to Europe. Museums such as the Clark Museum in Williamstown, Massachusetts, Dartmouth College’s Hopkins Center in Hanover, New Hampshire, and the New York State Museum in Albany, New York, among others. In the 1980s, Witten passed on his knowledge to Paul Monfredo of Seal Harbor, Maine. Paul was a meticulous understudy, and has spent years exploring the techniques and materials used in traditional framing. 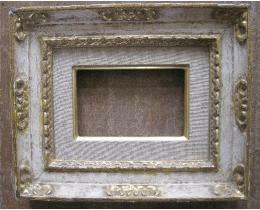 Monfredo has long mastered the art of carving, gilding and picture-frame-making to an ability exceeding his mentor. Monfredo lives in Maine with his wife and artist Nancy McCormick. 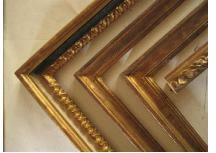 Paul has framed many important works of art for collectors, galleries, and artists. His work is museum quality and hand-crafted with attention and care. Nancy is a painter who brings a depth of knowledge about the history of European and American art to her intimate abstract landscapes.